Cold Fury is a story about Sara Jane Rispoli, a sixteen-year-old girl who’s life comes crashing down around her on her birthday. Her family disappears and she is left to deal with the aftermath of the event, while trying to figure out the secrets her parents kept from her. This book took me a bit by surprise. From the summary, and even the cover, I expected this book to take off from the first pages. However, for me, the beginning was a bit slow. Written from Sara Jane’s point of view, she takes us through memories and events in her life that shape what happens on her sixteenth birthday. Sara Jane’s two friends Doug and Max are fun additions to her journey. Honestly, I would’ve liked to have a bit more Max in the story. To me, he plays a part in defining who Sara Jane is as a teenage girl and I think that aspect is needed in the story. He was also a good balance to her crazy life, but like I said, there just wasn’t enough of him. Overall, I actually enjoyed this book, even with the slow parts. T.M. has a great grasp on the workings of an organization and it was fun reading how he entwined that into the story. While I wish some aspects were a bit different in the book, I am interested to see what happens next. Make sure to pick up your copy of this fresh new voice in YA! 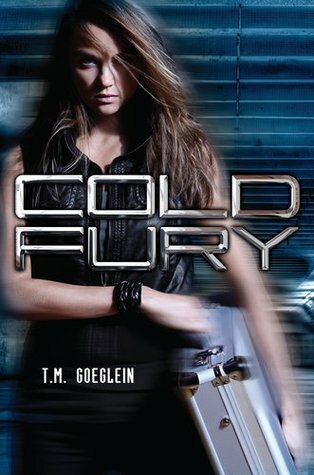 Cold Fury comes out July 24th! Let me know what you think!